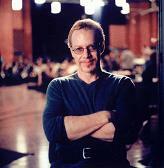 Director Tim Burton and composer Danny Elfman have worked together many times now. It was only a few weeks ago that their version of Roald Dahl's "Charlie and the Chocolate Factory" hit the screens and here they are again with "Corpse Bride". Johnny Depp has also moved from his role as Willy Wonka to voice the main character in "Corpse Bride". (Note that Depp also starred in their successful "Edward Scissorhands" and "Sleepy Hollow".) This time the story has come from the vividly weird imagination of Tim Burton and yes, this is not a live action film but a stop-motion animation with inevitable comparisons to "A Nightmare before Christmas". 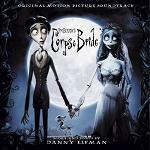 Although "Corpse Bride" does have some songs, it is not a musical to the same extent as "A Nightmare before Christmas" and much of the music is instrumental in nature. However it has the same infectious good humour with a touch of the gothic as you might expect from the title. The part of the female lead is played by Helena Bonham Carter as the "Corpse Bride", Danny Elfman himself sings the part of "Bonejangles" and there is a great cast of (mainly British) voices including Emily Watson, Joanna Lumley, Albert Finney, Tracey Ullman, Paul Whitehouse, Richard E Grant, Christopher Lee, Michael Gough and Jane Horrocks. The story begins when "Victor" (Depp) is in a dark woods rehearsing his lines for his marriage to "Victoria" (Emily Watson) and accidentally says his vows to a Corpse instead! Musically the Main Title is one of those great "once upon a time" instrumentals that Elman excells at, and bears comparison with the opening music of "Batman Returns". Then According to Plan is a great comic song with the voices of Tracey Ulman and Paul Whitehouse as Victor's upbeat parents and Joanna Lumley and Albert Finney as the deliciously downbeat parents of "Victoria". After some effective instrumental scoring which takes us into the whole concept of the story, the next song is Remains of the Day sung in the underground bar by Danny Elfman as Bonejangles and his skeleton crew. This is a witty jazz number with lots of bone tingling xylophones. Tears to Shed is the Corpse Bride's song and reminds us that corpses have feeling too, with the voices of Helena Bonham Carter, Jane Horrocks and Enn Reitel. A later song called The Wedding Song is a big ensemble choral piece building excitement for the big event using a great mixture of song styles from "Gilbert and Sullivan" through to "Rogers and Hammerstein" with a sprinkling of "Nightmare Before Christmas". The Bonus Tracks on the CD are also a lot of fun. Elfman's soundtracks of 2005 see the composer back on form, and the Corpse Bride CD is available from either of these links: Amazon.co.uk in the UK, or Amazon.com in the US. The book illustrated at the right is the piano sheet music for Tim Burton's Corpse Bride which contains selections from the movie, including vocal parts and guitar chords.